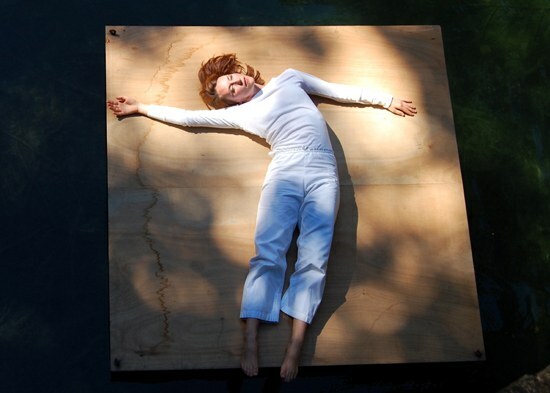 Tentindo in Trisha Brown’s Raft Piece. Photo by Carrie J. Brown, Courtesy Trisha Brown Company. Trisha Brown Dance Company’s Laurel Tentindo is a study in fluid energy. In a recent rehearsal for Brown’s Set and Reset, the lean redhead sliced across space with blade hands rebounding against the air, the aftershock reverberating up her pliable spine. Even standing still, she appears to move in minuscule vibrations. Turns out, this is no mistake. “I don’t think of the body as bones and blood,” she says. “I think we’re strange water, fluid, fascia balloons moving in space. If we can always find spaciousness in our tissues, from the top of our spine to our heels, we have more freedom to move.” DM chatted with Tentindo, who has been with TBDC since 2007, to find out how she maintains the healthy mind-body balance that informs her dancing and well-being. Growing up in Essex Junction, Vermont, Tentindo studied ballet and non-traditional theater. Instructors from Les Grands Ballets Canadiens de Montréal who taught at a local studio, The Movement Center, gave her the unadorned classicism that, along with improvisational skills learned in drama classes, serves as the basis for her technique. Every morning, Tentindo applies these principles as she takes time to “check in with my energy and spirals,” she says, referring to spiraling the muscles around the spine in opposite directions. “Perhaps I’ll stretch in my bed or on the floor, completing the simple spiral of shifting my bent knees to one side and looking to the other side. I might also put my legs up on the wall, letting the femur drop back, and feel the weight in my body as I breathe. Then, if I’m heading to the studio, I tailor my warm-up to what I’ve found in that initial investigation. I begin by slowly breathing and softening in different areas to practice releasing.” From there, Tentindo might do a modified version of the “spiral series” that she learned from anatomy and kinesiology expert Irene Dowd. “The basis is flexing and extending the major muscles while spiraling.” Then, either standing or lying down, she works in “continuous, multi-directional alignment, traveling through space,” which might manifest in arm swings, tendus, or dégagés. Throughout rehearsal, Tentindo often checks in with her feet because “that’s where the weight should be.” At times, she concentrates on switching “into a tai chi state,” she says. “When I’m first seeing a phrase, I’ve learned to mark, using initiation points but not ripping into it immediately. Knowing how to modulate the volume on your output as you go through rehearsal, softening sometimes and popping at others, is so important for longevity.” She completes her routine on rehearsal days by icing andelevating her legs. Lauren Kay, a Dance Spirit contributing editor, is a dancer and writer in NYC.